Working at a sub-acute clinic was totally new to me, as this was my introduction into the medical world. We see a lot of patients being submitted and later leaving for home again, in a better position than before, and in my short time here there are a few cases that I think will stay with me forever. On the 5th of January 2018 Odelle Tshamano was transferred to us from a hospital where he was treated for injuries sustained in a motor vehicle accident. Lynnmed Clinic has a history with the Road Accident Fund with patients that is sent to our facility for rehabilitation. So, Odelle’s transfer and submission was nothing out of the ordinary. In my perception, as someone that has no medical background whatsoever, this young man looked as if he would never have a normal life again. He had a peg-tube, struggled to communicate and was in a wheelchair with limited mobility. Odelle’s mother was by his side most of the time trying her utmost to keep him positive – pushing him, and us to do more. I could see his visitors encouraging him to stay optimistic, his friends and family ensuring him that they would always be there for him. Our physiotherapist, occupational therapists and speech therapist tirelessly continued to treat him and slowly but surely he became stronger and more mobile. What a wonderful day when he could eat again without a peg-tube. This was one of the things he really desired to do again and its also something that we so easily take for granted. Unfortunately, he had to wait a little bit longer before he could savour Chicken Licken again. In time, Odelle became part of our family. He would walk up and down in the hallway, or sit in his chair with books studying and even started listening if phones were ringing that, in his view, the nurses couldn’t get to quick enough. It was not long after that Odelle could jog up and down the hall fueling everyone with his zest for life and energy. It was Easter when Odelle could at last leave the Clinic and go home. We experienced happy and ecstatic feelings that he could join his family at home, tinged with a bit of sadness that a new friend would leave an empty space in our hallways. If there is one thing we learnt from this young man was that you should never ever give up. It is astounding what can be achieved with continuous positive re-enforcement, a lesson that I will not forget. A patient needs the help, upliftment and encouragement of his or her family and friends. Hope is what keeps us going. 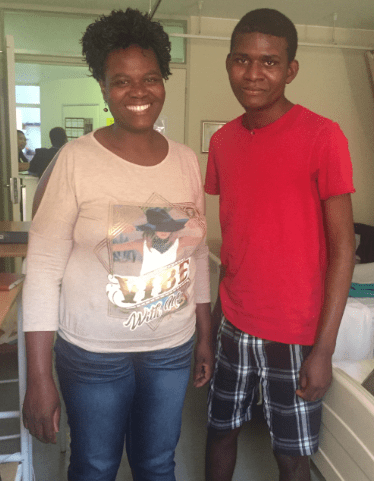 Thank you to the Road Accident Fund, who funded Odelle’s rehabilitation and gave him the time and treatment he needed to get where he is today. And thank you Odelle for teaching us that there is always hope and that we should never give up on ourselves or others. Odelle Tshamano was one of those patients that makes what we do here at Lynnmed Clinic worthwhile. After being involved in a motor vehicle accident and having his initial treatment at a local hospital, he was sent to Lynnmed for further rehabilitation. Upon initial assessment, Odelle had no verbal response and appeared very frustrated. He had movement in all limbs but not goal directed or functional. He was able to stand with assistance of one person for transfers to and from the wheelchair. Physiotherapy treatment during his time at the clinic had to progress as Odelle progressed. He was very motivated with therapy, always willing to be pushed to his limits. At Odelle’s time of discharge he was walking independently. He was even able to climb stairs without assistance. We were also working on getting him running so that he could fulfill his dream of one day playing soccer again. Mr Tshamano received occupational therapy during his admission to Lynnmed clinic. He initially needed maximal assistance in washing and grooming, dressing and feeding through a PEG tube and basic personal hygiene. He could not distinguish between basic colours and shapes. He didn’t know what to do with a pen or hair comb and couldn’t follow instructions. Mr Tshamano showed remarkable improvement in his functioning and by the time he was discharged he could feed himself and even offered to make tea for the administration ladies. He was completely independent in showering, dressing, feeding and even washed his own dishes and laundry as part of therapy. He could do Grade 5 math and was able to explain complicated concepts to others. It was a pleasure treating him.